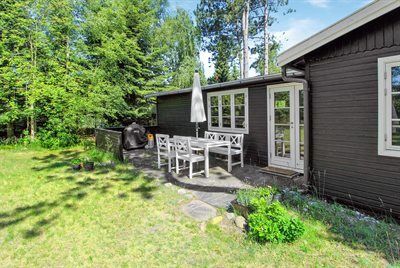 A really charming and cozy 62 m2 summer cottage from 1959 lying on a 1159 m2 natural plot perfect for ball games approximately 1.5 kms from the sea. Nice terraces on both sides of the house. The bathroom is placed in an annex next to the kitchen. The house lies not far from Nykoebing Sjaelland, Roervig Marina, and good child-friendly sand beaches. Two of the beds are placed in the annex. 1 pet is allowed. Holiday home suitable for 6 persons . 1 of the beds is only suitable for an older child (4-11 years). The holiday home is 62 m² and is build in 1959. You can bring along 1 pet.The holiday home is equipped with 1 energy-saving heat pump. The holiday home has washing machine. Tumble dryer. Freezer with a capacity of 30 litres. Further more there is 1 wood-burning stove. The holiday home is situated on a 1159 m² natural site. Situated 1700 m from the sea. Trampoline. Barbecue at your disposal. Parking place by the holiday home.